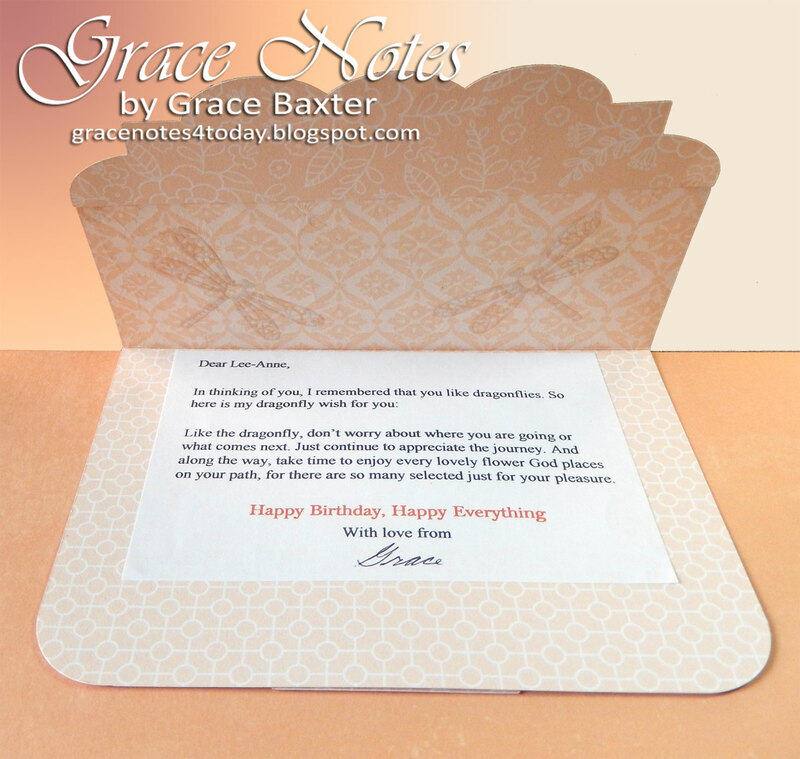 My plan for this elegant birthday card was to use some beautiful double-sided cardstock from a Rose Quartz stack. I wanted an organic feel for the card that would create a home for the Dragonfly. My recipient, who has a fondness for dragonflies also loves sparkle and glam. I wanted a unique shape for the card front. I love the scalloped edge. See how I've used it before in a card I made to resemble a clutch purse in my post called, PURSE-onality. To show off the gorgeous CS to its best advantage, I made the front shorter than the back. The card then needed an easel to enable it to stand and be displayed. Note: Full step-by-step instructions are available for this card in a PDF download. Leave me a comment below to ask how you can receive my PDF. There is a small charge for the PDF of this design. 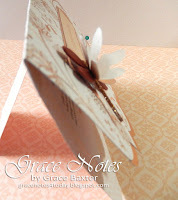 To emphasize the theme, I stamped and heat embossed dragonflies on the inside top panel. 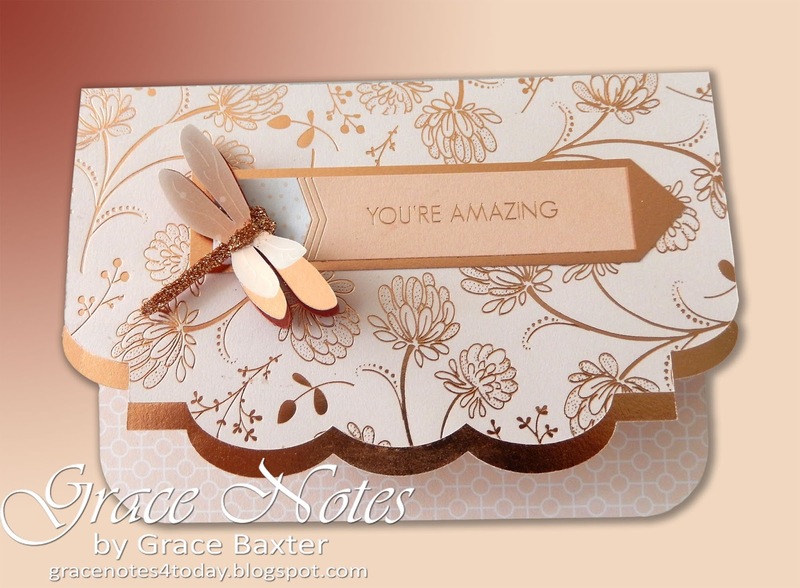 You will also notice three coordinating cardstock designs used here. Double-sided Cardstock with foiled rose-gold designs. 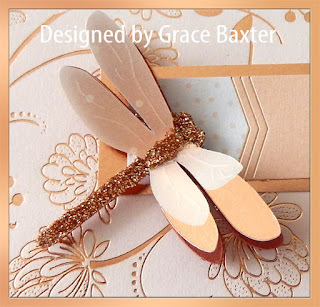 The simple floral design on the front is perfect for the dragonfly theme. In total, there are FOUR patterns of cardstock. The wings are in 3 layers. For added glamour and colour matching, I loaded up his body with rose gold glitter. My recipient loved her card (which is always my goal).